In 2003 I bought the starboard hypersonic 105, it was my first 'new' board. I bought it early from a teamrider (I think he didn't really liked it). The board replaced my AHD freerace 289, and WOW this was an amazing step forward for me. In 2006 I replaced the hypersonic 105 with a isonic 105. I remember it wasn't such an exciting improvement as before, from 2007 till 2012 I was a sponsored rider and tried a lot of stuff. HOWever never I had this feeling like I had when I replaced my AHD for the hypersonic. Last year I placed an request for a hypersonic and by coincidence I could buy my very own board back. However when I got a bit excited the seller almost decided to keep the board, I quickly gave him the money and the board was mine ;). And now one year later I got to use the board in various conditions. I tested it next to the new iSonic 107 wood 2014. Was it a downgrade stepping from 2014 isonic to the 2003 hypersonic? I would not say it is a downgrade or upgrade, they are different. The iSonic is a perfect slalommachine, with a very good turningradius and gybing ability, the hypersonic is just not that quick around the corner. The hypersonic however can take a very big sail without problems and it goes off in very light wind, yet the hypersonic also takes the 7.0 with good speed. I have to test with smaller fins. + higher precision (flat=flat and finbox in middle+ straight). + less physical on back foot/legs. 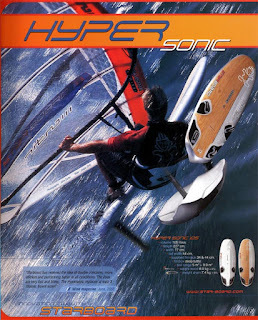 - hypersonic is better if you don't want to change trim and fins everytime the wind or chop changes. For crossing the IJsselmeer the hypersonic is interesting, it deals with a wider range of conditions (wind and chop) and that is perfect if one has to sail for a long distance (because conditions change over time and distance). I don't win or lose at gybes, the only thing that counts is comfort, speed and that in a wide range of conditions without having to change fins or other settings at sea (saves much more time). Topspeed, which would win? Both can do 70km/h+, but I believe the iSonic does achieve topspeed somewhat quicker. Hypersonic technique top secret tip!?! Have you ever looked closely to the bottom shape, it is quite complex. However there are multiple ways of running the hypersonic through the water. 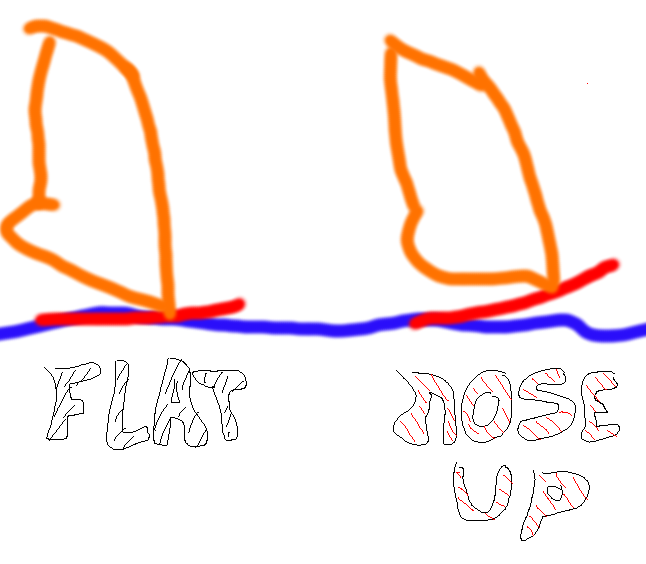 This technique tip makes you able to increase performance significant, remember one thing, the drag does not increase significant when a hypersonic runs flat on the water (thanks to the concaves the "wet" area does increase less compared to a traditional slalomboard). 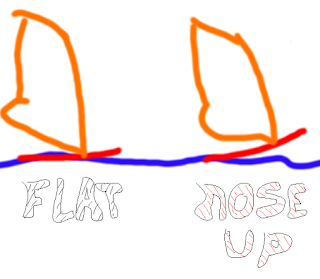 The technique is about locking the board in a favorable direction and reaching maximum speed at this course, this can be up-, cross- and downwind. Enjoy your ride on the course you selected! I've been told the hypersonic is the board Starboard are most requested to bring back into production.